Some guys just seem to be particularly in love with this hobby of ours. Mike Rutherford, 38, of New England has long struck me as one of them. Check out his Web site, which is stuffed not only with pictures of his own kit buildups, but with information about model kits both past and present and plenty of other genre subjects of interest to hobbyists. 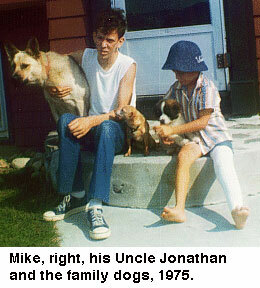 Mike’s also a family man; his wife is Melanie, his kids are Michael and Madison. Resin the Barbarian: You strike me as someone who truly loves this hobby and has for a long time. How long have you been involved in building kits, and what got you started? Mike: Hello Todd, and thank you for this opportunity. What got me started was my Uncle Jonathan, in 1971. When I was 4 years old and he about 10, he had both the Victim and the Frankenstein “Monster Scenes” kits. We would play with these as toys. My grandmother had an old birdcage that we would use as a cage for the Monster to put the Victim inside of. However, I didn’t get a model kit of my very own until a few months later. It was a glow in the dark kit called “Fiend” that was made by a company called Lindberg. 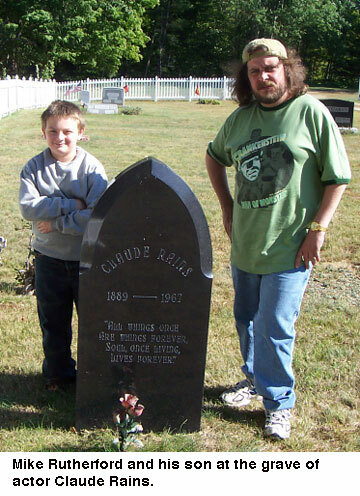 Between the two of us, my uncle and I, we had most of the Aurora monster line. If it hadn’t been for him, I truly wouldn’t have known the love of this hobby. I’m glad that I was able to tell him this before his unforeseen passing this past March. 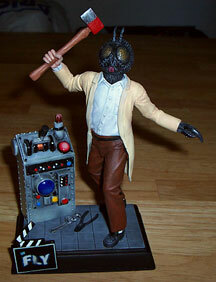 RtB: Which came first, your love of classic monster subjects or love of model kits? Believe it or not, what really hooked me was the box art. I was just obsessed with this art, as a kid and I still am. RtB: Have you ever NOT been involved in building model kits? There were times when I didn’t build but it wasn’t because I wanted to stop. However, I’ve been involved with the Aurora monsters at some point during each decade. During the end of the 1970s I was forced to stop building when Aurora closed their doors and there really wasn’t much else available unless I wanted to build cars, spaceships or other vehicles and I truly wanted no part of that. I’m a Maker of Monsters. In the early 1980s I was hospitalized for a few weeks. During this time, my grandparents came to visit me with a couple of big boxes full of my (newly married) uncle’s old Aurora kits that he no longer had room for. It was cool to get these at this time because they were off the market for a few years. Because of the fact that I had absolutely no knowledge of garage or resin kits, I was away from the hobby until the birth of Polar Lights. The funny part about this is that I didn’t even know that there was even such a company as Polar Lights until my wife and I went shopping one day with my son, who was just a baby at the time. He was riding in the shopping cart and he threw his bottle out of the cart. When I bent down to pick up the bottle, I saw (on the bottom shelf) the Mummy box art looking back at me. My wife wasn’t really sure what I was so excited over but I’ve stayed in the hobby ever since that day. Todd here, with an interruption: My own rediscovery of the hobby probably happened a few years after Mike’s, but I also have my own, similar story. 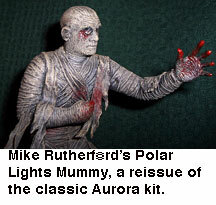 My wife, 1-year-old daughter and I stopped into Grand Junction’s now-defunct Toys R Us in October 2001, and there on the clearance table near the entrance was a collection of Polar Lights kits, including the one my wife talked me into buying, the Mummy. RtB: You use the name “Trendon” (“Trend” rhymes with “end”; “on” like “un”) on various Internet model-kit forums. Why? Mike: Trendon was the name of the first band that I played in during high school. I use it as a handle on most message boards because I don’t even think that it’s a real word and thus, I figured that no one else would have already taken it as a user name. However, I recently discovered that there is a person that uses it on MySpace. RtB: The kits you paint often have a very bold, bright look that still manages to fit the black-and-white, scary-movie nature of the subject matter. What approach do you take to painting a kit? Mike: That really all depends on the kit itself. I basically paint in two styles. The first being that I’ll paint something to look as realistic as I’m able to make it look. The second being the Aurora look where I basically try to paint something the way that I think James Bama (painter who created the majority of the Aurora monster-model box art) would have painted it with those bright, off-the-wall colors that basically represent light and dark. The Aurora look is starting to be a trademark for me. I may start painting non-box art kits in this style. I’d love to experiment with this on a kit from the “Yagher Classics” series. I tend to paint from light to dark but I will occasionally work backward. I have never used an airbrush and I have no plans on doing so. People have accused me of using an airbrush because I have achieved the effect of smoothly blending one color into another but that’s all done with a flat head brush in an almost drybrush circular motion. With every kit that I work on, I tend to use a lot of washes and drybrush effects. I’m also one of those modelers that use the cheap craft paints like Delta Ceramcoat. RtB: You participated in my blog in August by giving me a list of suggested model kits for Halloween, and all of the kits you suggested were sculpted by Jeff Yagher. What can you tell me about the friendship or association you seem to have built with Mr. Yagher in the last couple of years? Mike: Really? I didn’t even realize that Jeff sculpted all my choices but that’s cool. As you know, I have been a big supporter of the Aurora Box Art kits by Monsters in Motion since day one. When the first three kits in this line were released (“The Phantom,” “Wolfman” and “Jekyll as Hyde”), I basically promoted them and gave them tons of free advertising on my Web site. I did this because I truly do LOVE this series of kits; I never expected anything to come of it. One evening, I received this anonymous e-mail telling me that MiM now had the “Dracula” kit up on their site. The person never signed the e-mail so I just hit reply and thanked them. Some time later, this same person sent me photos of the “King Kong” sculpt for me to post on my Web site. The first thing that I did was to check the MIM Web site and oddly enough, they didn’t even have these photos up yet. I e-mailed this person back and told him that I wasn’t really sure about posting these photos to my Web site without permission from MIM because the last thing that I wanted was for them to be upset with me for showing off their new product before they did. It was at that point that this person revealed their identity. We’ve been in contact ever since. RtB: Your Web site is a great resource. Do you have any idea how many hours per week you average working on that? Mike: That all depends on what’s going on at the moment. If I’ve finished a kit, I’ll post the photos. If a producer or sculptor asks me to help advertise a kit, I’ll do it. If things are slow, I’ll create things like “The Library of Box Art” or the “We Remember” features to keep the viewers interested. • Sculpted by Jeff Yagher. • Price: $50 plus shipping. • Available from Retro Resin. • 19 or 20 parts, including an extra hand that gives the modeler the choice to use the hand that holds the axe. • A continuation of the classic Aurora series of model kits from the 1970s. RtB: Did you help put Retro Resin in touch with Jeff Yagher? 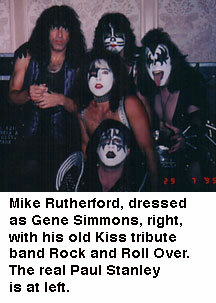 Gene and I have been friends for five or six years and I knew that the combination of Jeff’s sculpting talents and Gene’s quality castings would be perfect together. 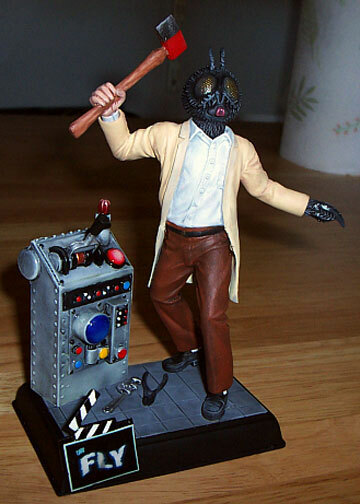 There are some rumors floating around that the next project between Jeff and Retro Resin is going to be a “Monsters of the Movies Phantom of the Opera” for 2007. If this does indeed come to pass, I’ll post the news on my Web site. RtB: What was the most challenging aspect of building and painting this kit? Mike: I guess the machinery. Basically, this was just a very FUN kit. It was fun to build, fun to paint and very little aggravation. It was a very clean cast and an easy build. Like anyone else, I do enjoy a challenge from time to time but I also like to just relax and have fun, sometimes. This kit allows the builder to do just that. RtB: How did you get that woodgrain effect on the axe handle? Mike: OK, first I painted the handle with a coat of “Light Chocolate” (yes, that’s the actual name of this color of paint). After it dried, I took a darker brown and watered it down (like a wash) and I painted the wood grain freehanded. RtB: Plainly, you use the original Aurora box art as a reference while painting these kits. How do you do that? Are pictures taped up on the wall around you, or…? Mike: The first thing that I do (even before the kit arrives at my door) is I find a decent photo of the box art and set it as my desktop wallpaper. By doing this, I’m forced to see it every day and I’m able to study it. Aside from that, I’ll just use the actual boxes as a guide. However, this raised a problem with the “Phantom” kit because I don’t actually own that box. I spent many hours on eBay searching for photos. For whatever reason, the walls in the Phantom art sometimes photograph as a greenish color but other times, they look to be a grayish color. Due to the fact that the rest of these kits have bight, bold colors, I decided to go with the green. RtB: Monsters in Motion is now using your “Dracula” pictures on its Web site, which I found an improvement over the pictures it used before. Does MiM plan to use pictures of your other buildups, past or future? Mike: At one point, my “Phantom” was up there, also. The way that I understand it is that there is an inside artist for MIM (maybe even more than one) and I would assume that they would naturally want to use their own artists’ buildups because they’re paying them to build and paint these kits. Terry (the owner of MIM) did ask me about my Bride kit and how she’s coming along. It would be cool if they wanted to use my Bride but I guess that I’ll just have to wait and see. Right now, I’m just waiting for the release of the clear parts for this kit so that I can finish her. After she’s finished, I’ll send some photos over to MIM and wait to see what happens. This article was posted in 2006 archive, Monsters, Painters, Resin and tagged Monsters in Motion, Retro Resin. Bookmark the permalink. Follow comments with the RSS feed for this post. Both comments and trackbacks are closed.